Mystery Worshipper: Amanda B. Reckondwythe. The church: Cathedral of St Louis, King of France, New Orleans, Louisiana, USA. The building: This is the oldest church in Louisiana and the oldest cathedral in the United States. 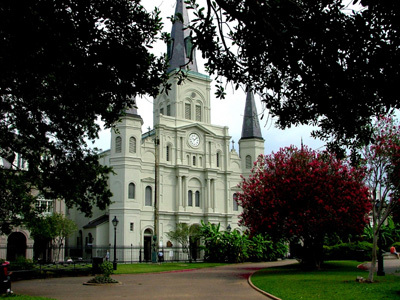 The cathedral escaped damage from Hurricane Katrina in August 2005 and, in fact, is maintained in excellent condition. At first glance, one is reminded of Cinderella's castle at Disney World. The striking white structure is topped by a tall spire flanked by two lesser spires of similar appearance. The interior is bright and inviting thanks to ample natural lighting and chandeliers with lights in the shape of candles. The eye is drawn to the Rococo high altar and to the vaulted ceiling covered in murals depicting various biblical scenes. Stations of the Cross in French line the walls. Stained glass windows depict events in the life of St Louis, including one remarkable window where St Louis bathes a leper's sores while his courtiers hold kerchiefs up to their noses against the stench. The church: The cathedral is a favorite venue for weddings and sponsors numerous cultural events. It is said to be haunted by the ghosts of at least two former pastors: Père Dagobert, who rescued the rain-soaked bodies of protestors shot after New Orleans was ceded to Spain by the French and celebrated a requiem mass for their souls; and Père Antoine, representative of the Spanish Inquisition who preferred to champion the plight of prisoners and slaves. On certain rainy nights, the ethereal voice of Père Dagobert can be heard chanting the Kyrie of the requiem mass. Many people have reported seeing Père Antoine on misty winter afternoons walking slowly alongside the cathedral in the alley bearing his name, and then vanishing into the mist when approached. He has also been spotted at midnight mass on Christmas Eve near the left side of the altar, holding a candle. The neighborhood: The cathedral dominates Jackson Square, a colorful park in New Orleans' French Quarter facing the Mississippi River. The square is named after General Andrew Jackson, hero of the Battle of New Orleans, which ended the War of 1812. After the battle, Jackson is said to have placed his sword upon the cathedral's high altar in thanksgiving. Surrounding Jackson Square is a pedestrian mall and an iron fence on which artists and artisans have displayed their wares for decades. The cast: The Most Rev. Alfred C. Hughes, Archbishop of New Orleans, was the celebrant, assisted by deacons Richard M. Brady and Ronald J. Guidry. The Rev. Msgr Crosby W. Kern, rector of the cathedral, was the gospeller. The date & time: July 2, 2006, 11.00am. The cathedral has room for about 1,000 and was almost full. People entered quietly and settled into their pews without visiting. I would imagine that most of those present were out-of-town visitors. "Good morning. Our archbishop, rector and cathedral staff welcome you." The entrance procession consisted of crucifer and acolytes in albs, lay readers in street clothes, the gospeller holding the Gospel book aloft, the master of ceremonies in a lace surplice over his cassock, and the archbishop flanked by his deacons. The gospeller and deacons wore identical green chasubles. The archbishop wore a green cope of the same pattern and a green mitre, and carried a wooden crosier. Seasonal Missalette. Archbishop Hughes apologized that no bulletin was available due to "an unforeseen interruption at the printer." Organ and trumpet. The organ was a large instrument located in the gallery. The singing was led by a leader of song, a young man in a business suit  an excellent tenor. He had the annoying habit of extending his arms when he wanted people to sing, but his efforts produced zero results except at communion ("Amazing Grace") and at the recessional ("America the Beautiful" in honor of the Independence Day holiday). I found very little to distract me, as I was paying close attention to the ceremony. It's not every day that one gets to attend mass celebrated by an archbishop. Nevertheless, there was a gentleman who tried to take pictures during mass, but was caught by an usher. Also, a thunderstorm was raging outside, about which I'll have more to say directly. A letter-perfect novus ordo mass, with all the ceremony one would expect at a mass celebrated by an archbishop assisted by two deacons. I found it strange, though, that the lay readers entered from the sacristy to give their readings, and then retired to the sacristy again afterwards. Why didn't they remain at mass? At the peace ceremony, the altar party exchanged liturgical embraces while the congregation shook hands. The leader of song offered a solo, the Mozart Ave Verum Corpus, at communion. 9  Archbishop Hughes had prepared his sermon well and spoke with careful enunciation. He clearly takes seriously his episcopal duty to preach. As the archbishop returned to his throne at the conclusion of the sermon, the master of ceremonies brought him a glass of water  without, it should be noted, the customary bowing and kissing. The archbishop spoke on the Gospel for the day, Mark 5:21-43, where Jesus healed the woman suffering from a hemorrhage and raised from the dead the daughter of the synagogue leader. Death is real and present, but we don't want to think about it. What is God's perspective on death? It was not part of his original plan for us, but came upon us via original sin and is thus the work of Satan. Christ triumphed over death, not only by healing the gravely ill and raising the dead back to life, but by his resurrection. Death is real but is not the last word. Our lives are a preparation not for death but for eternal life. Some deaths are premature, for example death as the result of violence. We must bring back the teaching of morality to our schools so that society can be steered away from violence. The air-conditioned cathedral was a welcome respite from the oppressive heat and humidity of a typical New Orleans summer day. But as mass progressed, the clouds opened, and a violent clap of thunder exploded at the exact moment of the consecration, and again as the archbishop took his communion. The lights flickered now and then as lightning could be seen flashing through the stained glass windows. Hollywood could not have orchestrated it better! As impressive as the ceremony was, it sorely lacked the finesse that a good choir could have supplied. Why won't Catholics sing? No point even in asking  the question has been the topic of books. And the organist clearly didn't expect the archbishop to chant the per ipsum, as there was an awkward pause before he began his accompaniment to the great amen. Everyone left rather quickly. Archbishop Hughes and the rest of the altar party were shaking hands at the back of the church. The archbishop was only too delighted to chat with people and to pose for photographs. There was none, but watching the archbishop schmooze everybody was much more satisfying than a cup of coffee ever could be. After it was all over, I stepped outside to notice that the storm had broken the oppressive humidity, and I walked across the square to enjoy a delicious lunch at a nearby restaurant. 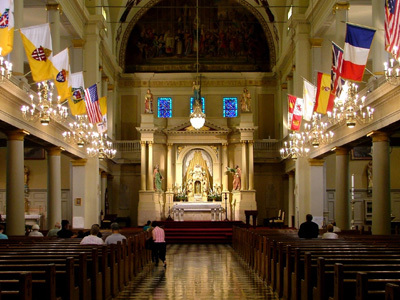 8  If I lived in New Orleans I would be back often, especially to the archbishop's masses. What a delightful man and a wonderful priest the archbishop seems to be.